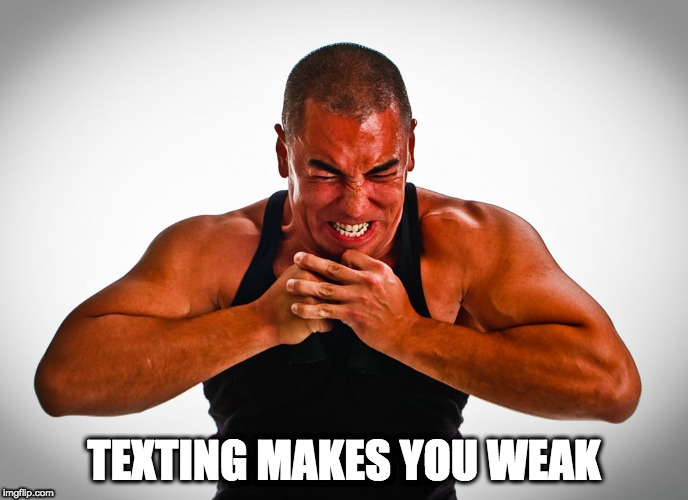 There’s an ongoing joke at the gym that “texting makes you weak”. It’s what I yell at people when they get on their phone during a workout. Most of the time it’s to check Facebook or respond to an text message that is anything but urgent. While I say it in a joking manner there’s actually a lot of truth to it. Basically what it comes down to is distraction. You only have so much energy to go around. 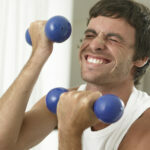 Are you giving your all to your training or are you giving it to your device? Pavel originally pointed this out in something he wrote about “being alone with your strength”. The lifter that sits at the end of the bench just staring at the wall in between sets is not some absent-minded meathead; while his body rests he is preparing his mind for his next lift. This is the mindset of a champion. A professional athlete would never have one foot in training and one foot in social media! You might think, “well I’m not a professional.” Perhaps not, but do you want to get the most out of your training or is mindlessly scrolling up more important? 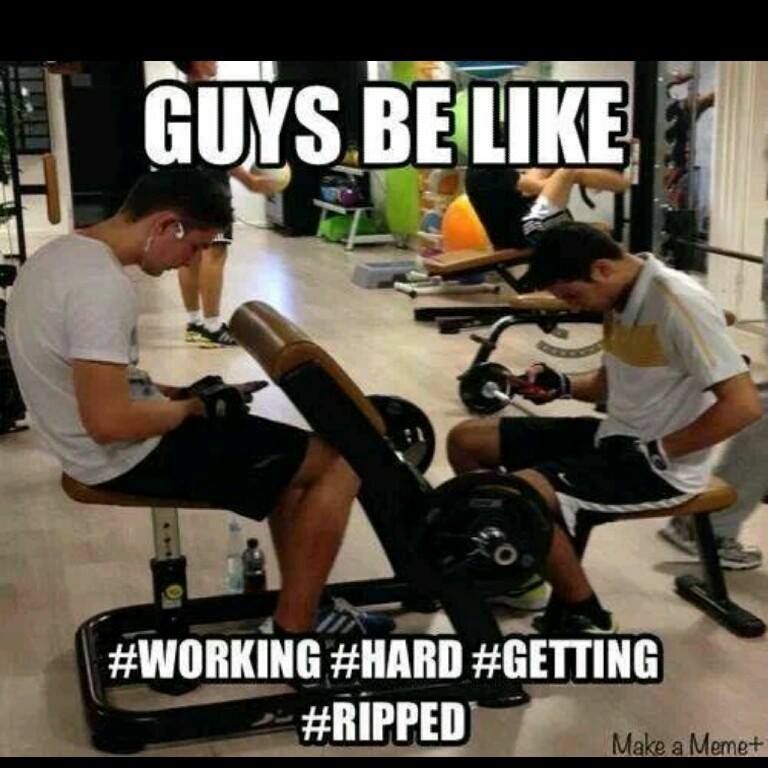 I think our social media habits can make us less effective not only in the gym but in other areas of life as well. It’s very easy to get caught in this trap, too. Harvard has done studies on the effect that smartphones have on the brain. Dopamine is released with every positive social stimulii and processed in the same area of the brain as drug addiction. So while social media likes might not be as powerful as a hit of cocaine, it’s addictive none-the-less. Don’t believe it? Can you quit? You might think that it’s not that big of a deal (denial) but let me ask you something else… have you ever gotten caught up in internet debate and missed an opportunity to be intimate with your spouse? Or play with your child? Have you ever thought about your next reply while you were working, training or trying to read/study? Have you ever been so engrossed in an online chat that you failed to have an actual conversation with someone you’re with? That’s a YES to all of those for me. I have prioritized social media over people in the past and sometimes those online relationships are people with whom I have no actual relationship with. When it’s been pointed out to me, that I’m spending time interacting with strangers while ignoring the people I love, it hasn’t felt good. There’s a national conversation that takes place online that’s usually controversial and it’s always ongoing. It never stops! Granted, some of these things are very big deals. Some of these issues matter (many do not). Some of these things are the flag people fly under, meaning they’ve shouldered this burden and are willing to fight for it. However, I submit to you that social media is not the battlefield to fight for or against any of these issues. Real change doesn’t happen by spitting venom online. If you want to express your opinion or perhaps even become an “influencer” start a blog/vlog and put some serious thought into your position. Give your argument more substance than you could express in a bathroom post. If you want to see policy change get involved in actual politics. Go to a committee hearing or a debate. If protesting is your thing, have it at. Just realize that laws aren’t made with 140 characters or less. If you want to engage a friend on an issue you see differently, don’t do it publicly online! If it’s someone you’d like to keep as a friend give them the courtesy of a face-to-face conversation or at least a private message. And for God’s sake, don’t make blanket statements condemning everyone who doesn’t agree with you. Dehumanizing the “other side” is what caused the Cold War and it’s exactly what’s dividing our country right now. All of the “isms” being tossed around, the claims of “snowflakes” and the notion of “anyone who thinks otherwise can f**k off” is not a position of strength. It’s a position of weakness. It’s built on intellectual laziness, recreational outrage or virtue signalling, or all of the above. I don’t say these things as a person pointing the finger but as someone looking in the mirror. I’ve made these mistakes myself and I’d like to do better. I’d like us all do better. 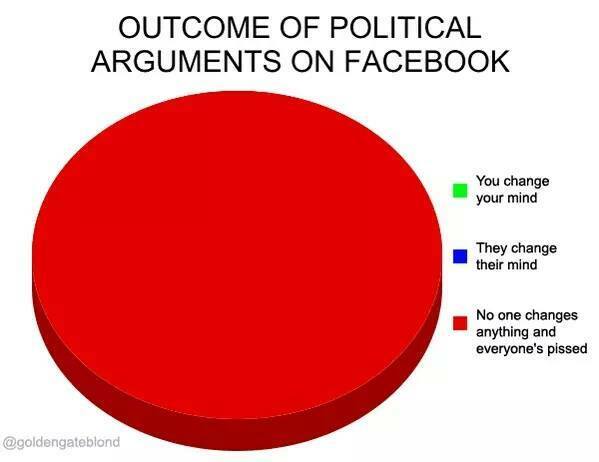 I’m usually pretty quiet when it comes to politics, so-called social justice and otherwise controversial topics online. But I’ve been tempted lately. Is it TRUE, FAIR & BENEFICIAL? Is it WORTHY of my time? Those first two questions are taken from the Rotary Club’s 4-Way Test. The last question is my own and was largely the deciding factor in my silence. Had I made the posts, I can tell you for certain that the “conversation” that would have ensued would have distracted me from my workout, my job coaching, my responsibilities as a parent, making love to my wife, and writing this post (all things that I’ve done in the last 24hrs). I’m not willing to sacrifice those things anymore. Social media is a great way to stay in contact with your friends and family, but it’s got it’s drawbacks. It’s addictive and it can waste time and energy that is better spent elsewhere. 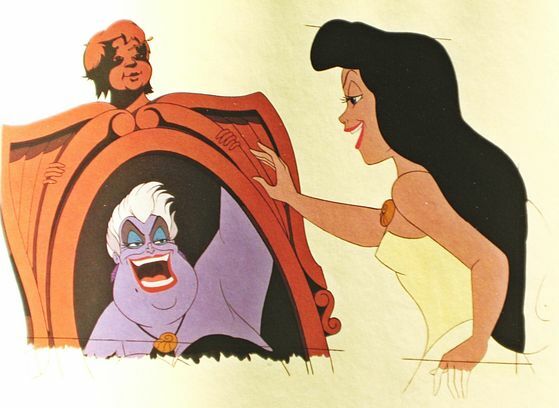 It quickly degrades into gossip and feigned outrage. It’s highly ineffective at making positive change in the real world and it’s a distraction to the things that really matter in life; your health (mental, physical and emotional), your relationships and your job. 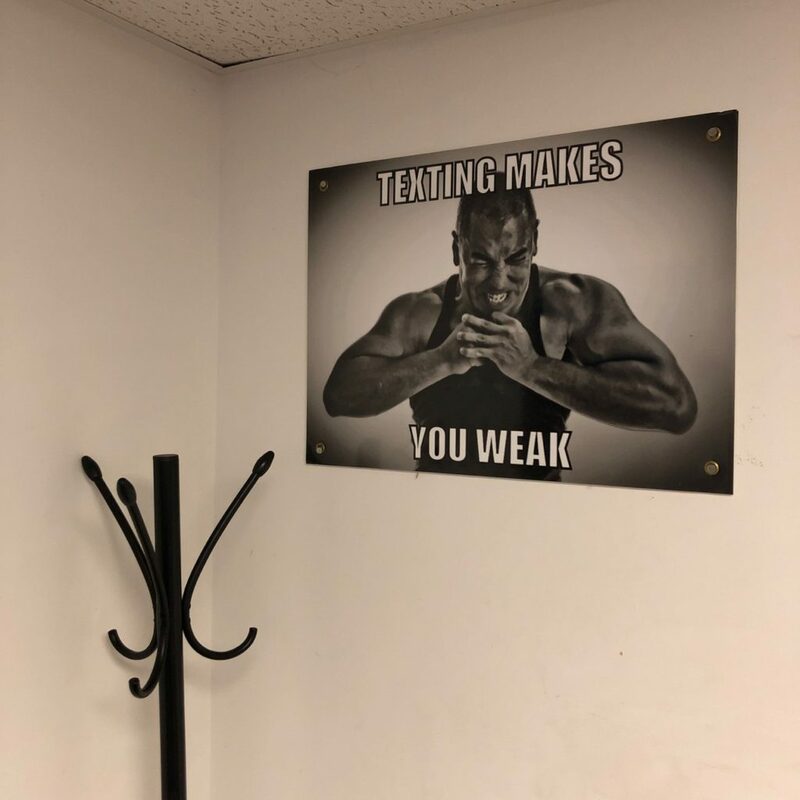 And don’t forget, TEXTING MAKES YOU WEAK! Actual poster hanging at BKC. Remember it when you reach for your phone!!! Have a great day yo’s, thanks for reading!